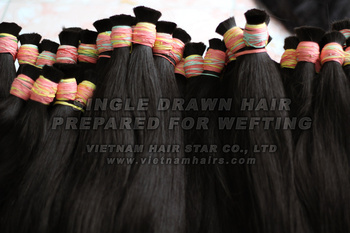 Vietnamese remy hair prepared for wefting, single drawn, premium quality. Only washed with shampoo. No lice, no nits. Color: natural dark color (#1, #1B, #2). Keywords: human hair, vietnamese hair, vietnam hair, natural hair, remy hair, raw hair, bulk hair, single drawn hair.